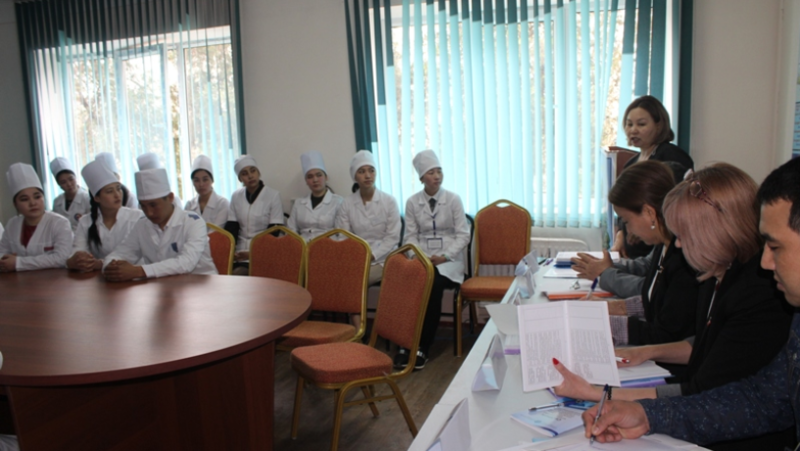 The Medical College of Osh State University has successfully passed international accreditation. The working group on the determination of compliance with international standards arrived at the medical college on the morning of March 27. On the same day, the experts examined the material and technical base of the medical college: they got acquainted with the laboratories of the college, where students are trained, conduct diagnostics, reactions, with auditoriums, where students study, with a large assembly hall, with small assembly halls, with a gym, canteens and other places. Further, all the experts attended classes of some teachers. Then, there were interviews with students, parents, graduates and teachers. The second day was mostly spent with checking the medical college documentation, of course, between breaks the working group was able to interview the college administration. At the end of the event, the experts were satisfied with the workflow of the college. The whole working group appreciated the work of the medical college at “5” and made commendable speeches. Presentation of the rector of Osh State University at the first forum of rectors of Kyrgyzstan and Russia.